Seems someone at the Google reader team is a fan of Konami games. 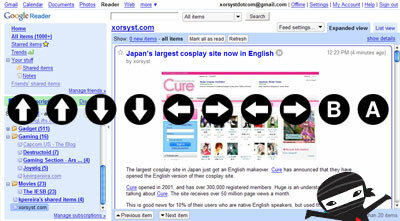 The now infamous Konami Code (â†‘ â†‘ â†“ â†“ â† â†’ â† â†’ B A) has been (re)discovered in the popular RSS reader. If you do use Google Reader, make sure you are at the Home window, and enter the Konami code using the arrow keys for the direction. The Konami code has made its appearance in more than 100 different games since 1986. Via Boing Boing.